Our body is made up of trillions of cells, but not only human cells. This may sound strange, but we are practically colonized by microbes such as bacteria, archaea, viruses, fungi and even some protozoa. This is known as the human microbiota. According to some calculations we have 10 times more microbial cells than human cells, which make up 1-2 kg of our weight. The major group of microbes that lives in and on us are bacteria. Hotspots for microbial locations are the gastrointestinal tract, mouth and nasal cavity, the skin and the urogenital tract. 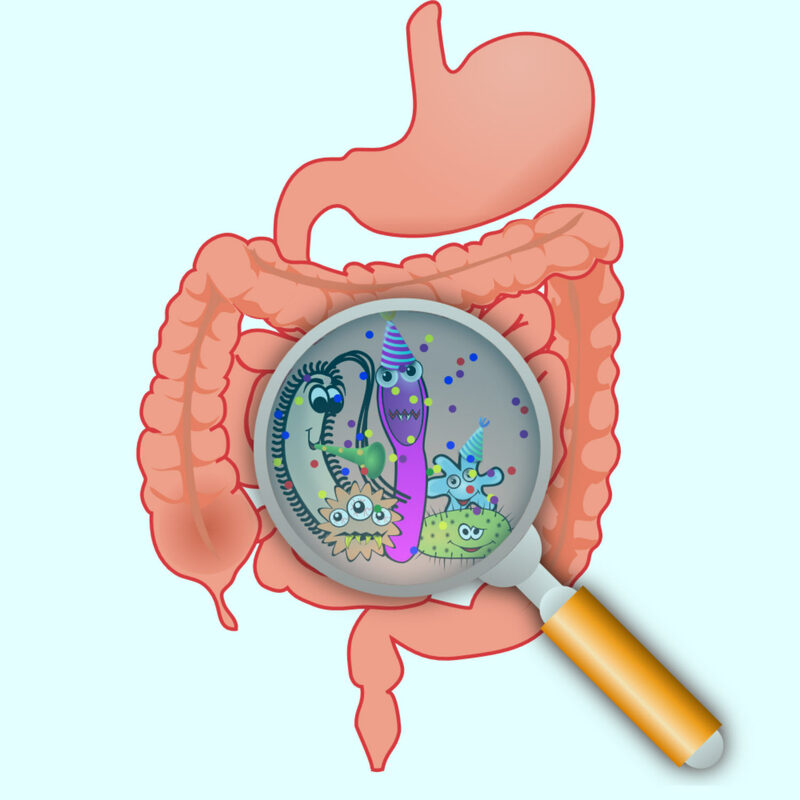 However, most of the microbes are localized in our gastrointestinal tract and that is called gut microbiota. But how do we acquire so much microbes and when do we acquire them? Doctors have assumed that the first contact with colonizing bacteria occurs in the birth canal. But a group of scientist have found evidence of bacteria in the placenta, amniotic fluid and meconium — the tar-like first stool that forms in a fetus in utero. This has led some researchers to posit that the microbiome might be seeded before birth. But even as the number of papers supporting this idea grows, some scientists are holding back (Nature 553, 264-266, 2018). The human microbiota influences our health, our weight and even our behaviour. Studies have shown that there is a link between obesity and intestinal bacteria. To explore this idea, they used mice that live in germ-free conditions and do not have their own microbiome as a model. When they transferred the intestinal bacteria of overweight mice to these germ-free, normal-weighted mice, their weight increased (Nature 457, 480–484, 2009). neurotransmitters related with behaviour such as serotonin or dopamine. The microbiome may also be involved in diseases such as autism and depression, but these diseases are more advanced in mice than in humans (Trends in Neurosciences, 36, 5, 305-312, 2013). These aren’t the only influences that bacteria have on us. There were found some bacteria that produces antibiotics that kills pathogens like S. aureus which is a high risk factor of nosocomial infections. They showed that nasal Staphylococcus lugdunensis strains produce lugdunin, a novel thiazolidine-containing cyclic peptide antibiotic that prohibits colonization by S. aureus, and a rare example of a non-ribosomal synthesized bioactive compound from human-associated bacteria. Lugdunin is bactericidal against major pathogens, effective in animal models, and not prone to causing development of resistance in S. aureus. Notably, human nasal colonization by S. lugdunensis was associated with a significantly reduced S. aureus carriage rate, suggesting that lugdunin or lugdunin-producing commensal bacteria could be valuable for preventing staphylococcal infections. Moreover, human microbiota should be considered as a source for new antibiotics (Nature. 2016 Jul 8;535: 511-6). These findings suggest that our microbiome should be investigated to a greater extend in order to discover how these microbes are correlated with our health and what role do they play on a healthy and sick body. COPYRIGHT: This article is property of We Speak Science, a non-profit institution co-founded by Dr. Detina Zalli (Harvard University) and Dr. Argita Zalli (Imperial College London). The article is written by Dardan Beqaj, M.Sc. Microbiology, Eberhard-Karls University of Tübingen). Previous article9 Mite për parazitët !